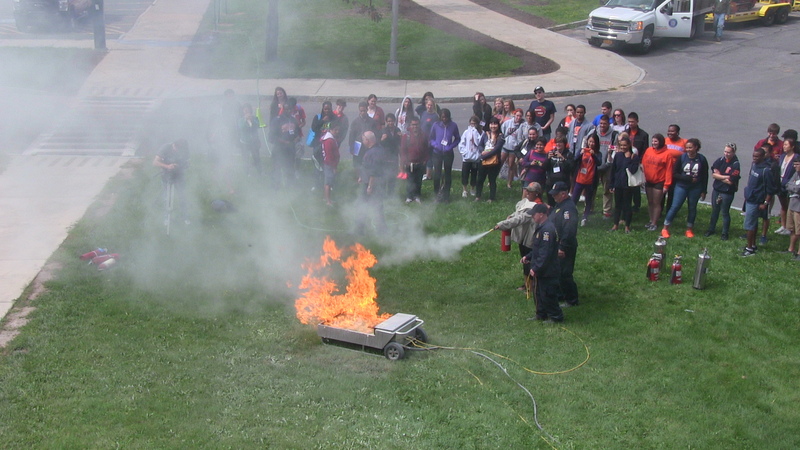 As part of fire safety training, residence hall staff learned how to use a fire extinguisher. It’s all done under the watchful eye of representatives from Syracuse University, the city of Syracuse, and New York State. It may be among the most important lessons learned at residence halls this semester—fire safety training provided by a host of departments from Syracuse University, the City of Syracuse, and New York State. This video highlights the efforts, which include a real-life demonstration of a fire in a residence hall dwelling. Fire Safety Training from Syracuse University News on Vimeo. Interviewer: “It is an extreme example of what can happen when a room goes up in flames and how quickly fire can spread. Syracuse University residence hall directors and assistant directors along with resident advisers recently took part in residence life fire safety training academy, learning about fire sprinklers and how they work, getting a chance to operate a fire extinguisher, even feeling what it’s like to have to navigate a smoke-filled hallway to safety. Interviewer: “It is worth mentioning one thing that keeps many of these resident halls safe. It was on display next to the burning room on Mount Olympus.